Do you remember all of the buzz about the arch from the Temple of Baal that was supposed to go up in Times Square back in April? Well, that project was ultimately canceled, but now it has been resurrected in a new form. In April a reproduction of a different arch, the Arch of Triumph, was erected in Trafalgar Square in London, and now another reproduction of that famous arch will be going up in New York City on September 19. This particular arch is not the same one that once stood directly in front of the Temple of Baal in Syria. Rather, the Arch of Triumph was constructed at a later date by the Romans, and it served to link the main street of the Colonnade with the Temple. So there is still definitely a connection with the Temple of Baal, but it is not as direct as had originally been envisioned. There are few cities in the world as much defined by their architecture as New York. The Empire State Building, the Statue of Liberty, the Brooklyn Bridge—all symbols of the audacity, strength, technical prowess, diversity and optimism of what Ezra Pound called “the most beautiful city in the world.” It is also a city that has known terrible loss—first and foremost the loss of life, but also the loss of familiar landmarks that helped inform the city’s identity. The Triumphal Arch, a symbol of resilience in the face of loss, will be a fitting tribute to America’s great metropolis. The arch will stand in Manhattan, surrounded by buildings adorned with classical features suggesting the common cultural roots of East and West. We hope that you will visit us this fall to consider the relationship between people and the places they inhabit. Their website also features a public letter from their executive director which confirms that September 19 is the date when this arch will go up. You can read the public letter for yourself right here. Once again, I think that there is something important that I need to point out. 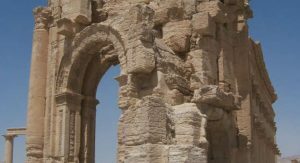 The Romans constructed this arch after a victory over Parthia, and in his extraordinary book on the Parthians Stephen M. Collins has shown that the Parthian Empire was largely made up of people that came from the northern tribes of Israel. 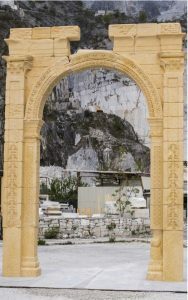 So the original purpose of this arch was to celebrate victory over the demise of the Northern kingdom, the 10 tribes of the house of Israel, aka Joseph/Ephraim. What does it mean? (Commentary from HN News editor) This is very very significant. I believe this is a gateway, a portal, to the demonic realm. This gateway has a connection to the Temple of Baal. Placing this arch in NYC is like placing a pile of manure outside your front door jof your home. The pile is going to attract flies. The arch is going to attract “critters” from the demonic realm. This is basically inviting the principalities of Baal and assorted company to this nation! Just as the Dome of the rock was placed on Temple mount as a symbol of “erasing and eradicating Jewish and Christian culture and presence in Jerusalem” so this gateway is a symbol of “erasing and eradicating” the 10 tribes of the north, AKA Joseph/Ephraim, who are HERE in the USA! THIS NEEDS PRAYER! The people behind this are trying to sneak this event under the wire. There has been virtually NO MEDIA coverage of this. Calling all intercessors to the wall to pray and come against this! And then, a few phone calls and emails would not hurt either! The other Triumphal arch is already in place in Trafalgar Square in London.